Looking for an easy Vegan BLT recipe? Well, you’ve come to the right blog! Check out this recipe for my 5-Ingredient Vegan BLT toasted sandwich. Feel free to view & print my recipe below to make your own vegan BLT, or watch me on YouTube show you how to make it! Today on The Edgy Veg, I’m going to show you how to make an easy Vegan BLT toasted sandwich with 5 ingredients! Who doesn’t love a good vegan toasted sandwich? I’m all about that delicious and healthy #carblife. On my YouTube channel, I show you 3 ways to make the Best Vegan Sandwiches 1) a Vegan Reuben Sandwich, 2) a Caprese Vegan Sandwich and 3) this Vegan BLT Toasted Sandwich. If you want to view or print the recipe card, just scroll down for the full list of ingredients and simple instructions on how to make this delicious tater tot casserole recipe. To make your 5-Ingredient Vegan BLT toasted sandwich, you’re going to need a tomato, lettuce or spinach, vegan mayo, slices bread of choice and smoked tofu! If you’re not a fan of tofu, swap it with a vegan bacon alternative of your choice. Here’s the step-by-step instructions on how to make this bad boy (or bad girl? idk you choose!) – First toast your slices of bread! Then cut up your smoked tofu into slices and heat them on a pan, about two mins on each side to warm it through. While the tofu cooks, take your vegan mayo and spread it generously on both slices of toast. Add your lettuce or spinach and then add your slices of tomatoes. Next, add your heated smoked tofu on top. And voilà! An easy Vegan BLT toasted sandwich for breakfast or brunch! Smoked tofu is amazing because it has such a great flavor and different from your regular vegan bacon. 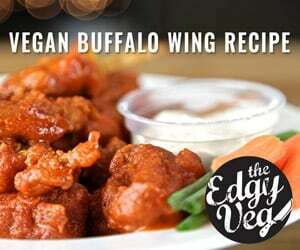 If you want more vegan recipes, click here for my newest recipes. This easy vegan sandwich is a fun twist on the classic Vegan BLT! It's 5-ingredients and the perfect vegan lunch idea for back to school, school lunches or work lunches. Then cut up your smoked tofu into slices and heat them on a pan, about two mins on each side to warm it through. Take your vegan mayo and spread it generously on both slices of toast. Add your lettuce or spinach and then add your slices of tomatoes. Next add your heated smoked tofu on top. You guys are going to love this easy Vegan BLT recipe! Once you try it, come back & leave me a comment below with your star rating and feedback! If you make this, share it on social! Tag @edgyveg on your photo & add the hashtag #theedgyveg in your caption so I don’t miss it!